Stephen Harper's chief of staff still enjoys the full confidence of the prime minister following revelations he wrote a $90,000 cheque to cover expenses claimed by Senator Mike Duffy, Harper's office says. But Harper's former communications director, while defending Wright, said Duffy's claims don't pass the "smell test." 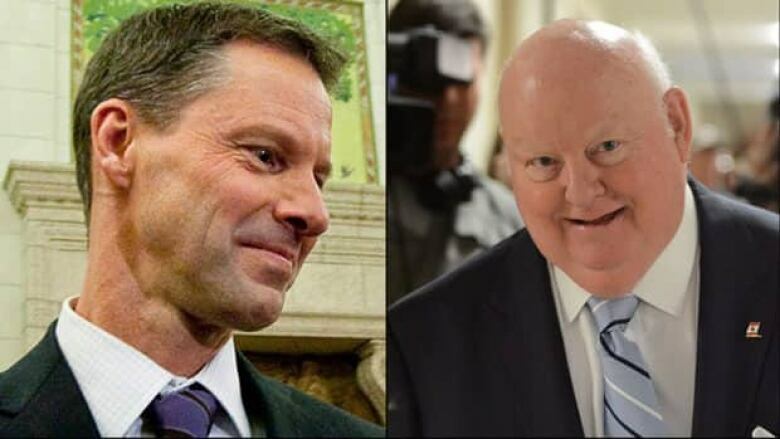 Nigel Wright, left, cut a personal cheque to cover the inappropriate housing expenses claimed by Senator Mike Duffy, right. Wright is Prime Minister Stephen Harper's chief of staff. Stephen Harper's chief of staff still enjoys the full confidence of the prime minister following revelations he wrote a $90,000 cheque to cover living expenses claimed by Senator Mike Duffy, Harper's office said today. Andrew MacDougall, Harper's spokesman, refused to say Thursday whether Nigel Wright had offered his resignation. Harper's office confirmed the payment on Wednesday following a CTV News report, but said that Harper was not previously aware of the arrangement with Duffy. MacDougall said the Prime Minister's Office will "co-operate fully" with the parliamentary ethics officer who is examining whether Wright was in violation of the Conflict of Interest Act when he wrote a personal cheque for Duffy. The money, drawn from Wright's own bank account, was used by Duffy to repay money he owed to the Senate for inappropriately claiming living expenses for the past four years. It is not known why Duffy couldn't repay the money himself, or why the Senate couldn't exercise its option of garnisheeing Duffy's wages to recover the money. It's also not known why the money was a gift from Wright, and not a loan. Duffy announced in a statement late Thursday that he was stepping away from the Conservative caucus amid the controversy. MacDougall said Wednesday that Harper did not know beforehand about the $90,000 gift from Wright to Duffy. Two other senators owe expenses money to the Senate and have been told they must repay the funds immediately. Both of them — Liberal Senator Mac Harb and Independent Senator Patrick Brazeau — have announced they plan to fight the Senate's order. "These claims about Duffy's expenses didn’t pass the smell test and Nigel clearly could not allow them to be left on the taxpayers’ tab. Duffy obviously didn’t have the means to repay immediately. Nigel has known Duffy for a long time — since the 1980s — and felt strongly about his situation and wanted to do the right thing. "I can tell you one thing, and I've known Nigel for years now, he's a salt of the earth kind of guy —so let's take what he did for what it is, a nice gesture by a good person. Sometimes, good people end up in politics, and when Nigel leaves politics, it won't have changed him, he will have remained a good, honest person. We need more Nigels in politics because he embodies the true meaning of public service." Wright, who was asked by Harper to be his chief of staff in 2010, is a wealthy businessman. He's the former managing director of Onex, the largest private sector employer in Canada. Onex owns or manages companies such as Indigo, Cineplex, Allison Transmission, Hawker Beechcraft and ResCare. A profile of Wright in Walrus magazine estimated that he was paid about $2 million annually in salary and bonuses while at Onex, and owns millions of dollars worth of stock options. He almost certainly took a dramatic pay cut when he came to the Prime Minister's Office, and told the parliamentary ethics committee, when it debated his nomination in 2010, "Public policy has been a passion of mine. For three decades I've had some involvement in the political process." Wright told the committee his first experience on Parliament Hill was when he left law school for a period in his 20s to take a job as a speechwriter for former prime minister Brian Mulroney. About being asked to be Harper's chief of staff, Wright responded: "A once-in-a-lifetime privilege, impossible to do anything with other than say yes." He added that Harper's values align with his in every way. Wright told the ethics committee he was taking a two-year leave of absence from Onex, and it's believed that he has extended that leave. On Thursday, an Onex spokesperson wrote in an email, "We understand that Nigel intends to return to Onex after his time as [the PM's] chief of staff and we're looking forward to that, but will not speculate on timing." Nelson Wiseman, who teaches political science at the University of Toronto, once described the chief of staff position as "the eyes, ear and nose" of the prime minister. He told CBC News Thursday in an interview that Wright is much more competent and experienced than former chiefs of staff who've worked for Harper and that he thought that the PMO was lucky to get him. But he said it would be "unwelcome to the PMO" that Wright's name is appearing in the media daily. The ethics commissioner's examination of the cheque to Duffy is not the first time Wright has attracted Mary Dawson's attention. Last year, he was reviewed because he had been lobbied by Barrick Gold three times while working in the Prime Minister's Office. Wright is friends with Barrick Gold founder Peter Munk, and his son, Anthony, who worked with Wright at Onex. On Wednesday, the ethics commissioner's office told CBC News that Dawson has discontinued her examination of Wright and Barrick Gold because "she no longer had reason to believe that Mr. Wright had contravened the Conflict of Interest Act. She did not issue a report."